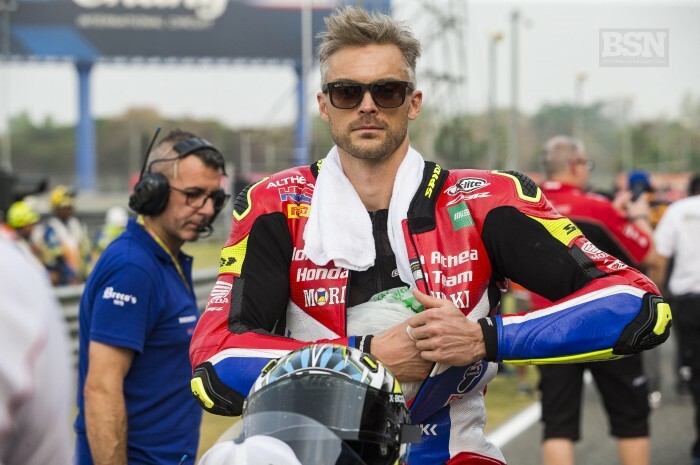 Moriwaki Honda’s Leon Camier has not had to undergo surgery on the leg he injured in a crash at the Buriram WorldSBK round and aims to be in a position to race at Motorland Aragon in a fortnight. Camier was in a collision with Thitipong Warokorn during the Sunday morning Superpole race and sustained a sprain with tibial spine avulsion to his right knee and was subsequently deemed unfit for race two. Back in Europe, Camier has undergone a series of medical check-ups which have fortunately confirmed that the damage sustained to his knee will not require surgery to heal. “Though his knee is currently still swollen and painful, Leon will soon begin some light exercises and physiotherapy, with the goal to be back on track for the third Round of the Superbike Championship in Aragon,” said a team statement. Worokorn sustained a fracture of fourth and fifth thoracic vertebrae but avoided spinal cord damage. He continues his recovery in hospital.